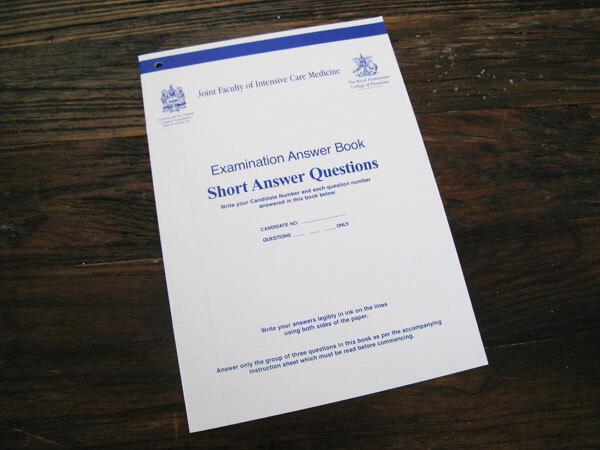 When you get to your written CICM exam you will be presented with writing booklets for each of your short answer questions. Each booklet contains 15 sides of writing paper. The paper is A4 size but looks smaller owing to its unusually wide line spacing. The lines are printed in feint purple which works well with black ink. The paper has a matt finnish and behaves nicely with my Uni-Ball micro pens. There is a hole punch in the top left of the booklet. I have made some mock exam writting paperto practice written answers on. The file is a 2 sided black and white PDF. Print it double sided and do not 'scale to fit'. If your printer does not support borderless printing just allow the edges to be lost. Printed correctly the lines should be precisly 13mm appart and the vertical margin should be 26mm from the left side of your paper. The Joint Faculty of intensive Care Medicine (JFICM) has recently become the College of Intensive Care Medicine (CICM). The cover of the exam booklet will change accordingly but the writting papper inside will stay the same. ANZCA uses the same style of writting booklets.